New to Windows 7? You can quickly take charge of the Microsoft Windows 7 operating system by knowing how to use the Start Menu and taskbar, Windows Explorer, new features (for Windows XP and Vista users), and keyboard shortcuts for common Windows 7 tasks. 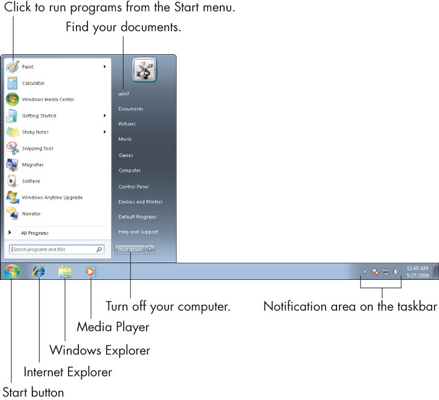 Search the Start menu: XP users have to hunt for programs on the Start menu. 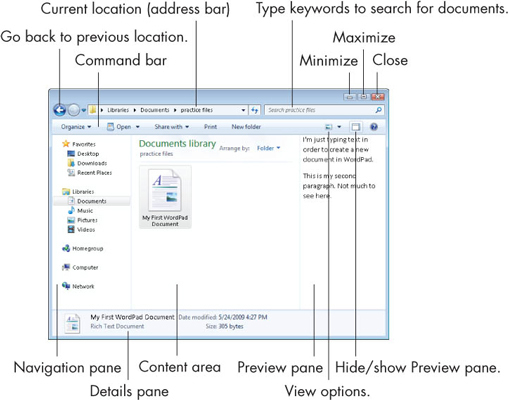 Windows 7 improves upon Vista’s feature for typing into the Start search box what you want to open (program or document name or content). Opening anything could hardly be faster or easier. Taskbar icons: You can now start a program that is pinned to the taskbar (always there). Taskbar icons indicate the number of windows open in a program and the progress in its background activities. Jump lists: With a right-click or click and drag, taskbar icons display lists of recently opened documents and shortcuts to common tasks for that program, such as creating a new document or playing all your music. Fewer UAC alerts: User Account Control security alerts occur much less often than in Vista but still provide essential security from programs you don’t intend to run. Action Center: Security and maintenance alerts appear in the Action Center, making it easier for you to assess your computer’s condition and take appropriate action. Aero Peek: Open windows turn transparent with Aero Peek so that you see through to the desktop, gadgets, and other windows that you might want to switch to (with Alt+Tab). Themes with automatic background changes: Instead of having one static background picture on your desktop, you can use themes to change the picture regularly in a new kind of slideshow on the desktop. Calculator history: Like the paper tape of old, the new calculator displays each of the steps you take in a calculation, and you can copy this history for pasting elsewhere. Device Stage: Devices such as printers and flash drives can display more detailed information and options than ever before. Improved Backup: Windows 7 provides a built-in backup program that can automatically backup your most important documents or your entire computer to a flash drive or portable hard drive.